AnonD-14379, 05 Dec 2012lols, Samsung Ativ S beats the NL920 in display contrast ratio, speakerphone test, and audio o... moreThat phone is already forgotten by samsung itself ... no signs of that phone what so ever in any kind of news. 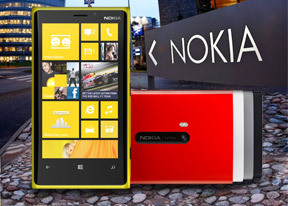 Biggest flop phone of all times ... all i hear about windows phones are Lumias and HTCs. U have to search for some store before u find a ATIV i guess ... such a cheap looking phone looks like some cheap phone sold on streets of some slum. hey nekko, 05 Dec 2012Build quality is.... Dissapointing (the are other ways to toughen the phone apart from making ... morelol ... probably u shud start making ur own phones. 1. Capacitive touch screen, that works with gloves, pen(cil)s, fingernails etc. 2. 1280x768 of real pixels, not a poor Pentail crap of SGSIII or sad joke of 640x1136 in iPhone5. 3. Competitors have larger screen because their are technoligically incapable of build a display with over than 300dpi. 8. Optical Image Stabilization which kicks a** when its about making videos, and making night/dark/party stills. The question is, with all those pros in mind, who would buy overpriced iCrap or overgrown Iron with touchscreen? Only apple and android fanboys, right? Is it really necessary to emphasize it is heavier than Note2? 183 vs 185 grams? What about those 50+ grams of protection cover that every Samsung and iPhone needs? And Nokia phones make it through a couple of hard work years without protection just fine. Anonymous, 05 Dec 2012The still camera was dissapointing. And WP8 doesn't support file management or USB host mode, ... moreYou're wrong, RKKy. WP8 DOES support file management for all content you create yourself (Documents, Videos, Photos and so on). Just plug it in via USB, and you're good to go. No Zune/Client needed. I've had much better results with the camera than this review has shown. PARTICULARILY for indoor/night photography. It may be N10 .....the next N-series with Windows!!! If its not N10, then Nokia will have no option but going with Android, again I have to repeat again the real n the best Android flagship ever will be from Nokia. go to this phone!! Very awesome!!! Perfect! The still camera was dissapointing. And WP8 doesn't support file management or USB host mode, features that I use. I guess I'd have to wait for the galaxy S4 for a decent upgrade. The king is back with extra dose of new power. After a while, it's rather difficult to differentiate one WP device from another, even if the one in question is a Nokia. In such a scenario, I believe Nokia's standout features need to be heavily and aggressively marketed. This is where Nokia fails, I'm afraid. They need some inspiration from Apple in this regard. I pretty like the way this review is written. The conclusion is, on one side, clear & useful on the strenghts and weaknesses of the phone/OS, and on the other side there is an emotive (dramatic ?) touch in it. A pleasant review, thanks ! Anonymous, 05 Dec 2012Exactly! I will be playing GTA Vice City on my iPhone 5 tomorrow :)I played it on my PC about 10 years ago, with mouse and keyboard instead of touching a glass surface. How about that?